The parish of Great and Little Plumstead is a relatively large parish to the northeast of Norwich. The parish has two main centres of settlement, Great Plumstead and Little Plumstead, which are also sometimes known as Plumstead Magna and Plumstead Parva. The parish stands close to the edge of Mousehold Heath, a large area of heathland to the northeast of Norwich which was still shown as open heath on Faden's map of 1797. There is some evidence for prehistoric occupation in the parish, and a number of prehistoric flint implements have been found, including a Palaeolithic flint handaxe (NHER 8151), and Mesolithic flints (NHER 14874) including a flaked axehead (NHER 10216), and a Mesolithic or Neolithic macehead (NHER 8169) made of quartz. Neolithic finds from the parish include axeheads (NHER 8153, 8154, 8490, 9648, 10217 and 34906), Neolithic scrapers (NHER 24240 and 22223) and an unusual Early Neolithic combination tool (NHER 8493), which was found on the site of three cropmark enclosure of unknown date. A Late Neolithic or Early Bronze Age plano-convex knife (NHER 42572) and a Bronze Age socketed axehead (NHER 34906), made of copper alloy, have also been found in the parish. An Iron Age toggle (NHER 42583) is the only Iron Age artefact to be found so far in the parish. Roman coins (NHER 34906 and 36598), pottery (NHER 36598) and a Roman disc brooch (NHER 29707) have been found, but so far, no other evidence of Iron Age or Roman occupation has been discovered. Plumstead comes from the Old English meaning 'the place where plum trees grow', and although no distinction is made between Great and Little Plumstead in the Domesday Book, it is recorded as a fairly substantial settlement divided between several different landholders. The only possible Saxon find to be recovered from the parish so far is a copper alloy and iron weight, which may date to the Late Saxon or the medieval period. The medieval parish church in Little Plumstead (NHER 8491) is uniquely dedicated to St Gervase and St Protase, martyred twins who are the patron saints of haymakers. The round tower and nave are Norman, and the church may date back to the Late Saxon period. St Mary's Church (NHER 10263) in Great Plumstead was severely damaged by a fire in 1891, and has been almost entirely rebuilt, incorporating some of the original medieval masonry, which dates mainly to the 13th century. Bryant recorded the existence of a second church in Great Plumstead, called All Saints' Church (NHER 17848) but its history and location are unknown. Medieval coins, buckles and other metalwork have been found in the parish (NHER 34907 and 36598), as well as a seal matrix decorated with the motif of a squirrel (NHER 34907) and an unusual double-sided medieval seal matrix (NHER 42572). A small valley in the east of the parish is the site of 'Dussindale' (NHER 21173), where Kett and his rebels were defeated by the Earl of Warwick and his army in August 1549. Boundary Lane now runs along the valley. South Lodge Cottage (NHER 21982) in Little Plumstead is the surviving part of a much larger 16th century manor house, and has diapered brickwork and pedimented openings. The Grange (NHER 13313) in Little Plumstead is depicted on Faden's map of 1797 as Plumstead Hall, and is a 16th century brick house, which was enlarged in the 17th century and Gothicised in the 1830s. The house has a walled garden with battlemented walls, Gothick gateways and 17th century brickwork. Great Plumstead Hall (NHER 12637) may date back to the 17th century, and also has extensive Gothick alterations. Smee Farm (NHER 11826) is a thatched 18th century farmhouse. 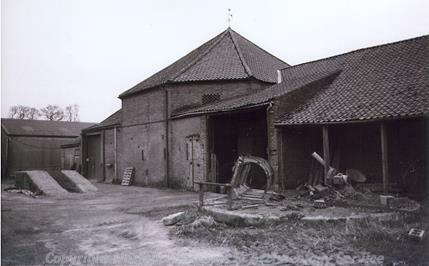 Manor House Farm (NHER 13172) is an early 19th century farm, and the house has giant brick pilasters and a circular central hall. The farm also has a brick octagonal engine house, a rare and important example of an engine house in the county. Little Plumstead Hall (NHER 8492) was built in 1889, on the site of an earlier hall which is shown on the tithe map of 1840 surrounded by a landscape park. An icehouse (NHER 13312) is buried in the area of the former park. The Hall was rebuilt in an 'Elizabethan' style, and has been a hospital since 1929. The clock tower (NHER 39763) in the grounds of the Hall was built in 1903, and is a rare example of an Arts and Crafts clock tower. In 2003 and 2004 the Norfolk Archaeological Unit carried out an evaluation in the area around the hospital (NHER 37644), the results of which are forthcoming. The Mission Hall (NHER 42797), on Salhouse Road is a good example of a prefabricated corrugated iron building that were mass produced in the 19th century. 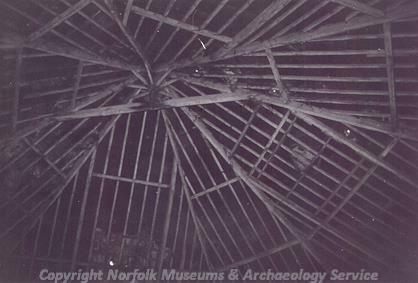 During World War Two a starfish bombing decoy (NHER 11783) was constructed in the parish, and was laid out to resemble the lights of an industrial area of Norwich. Sarah Spooner (NLA), 4 January 2006.